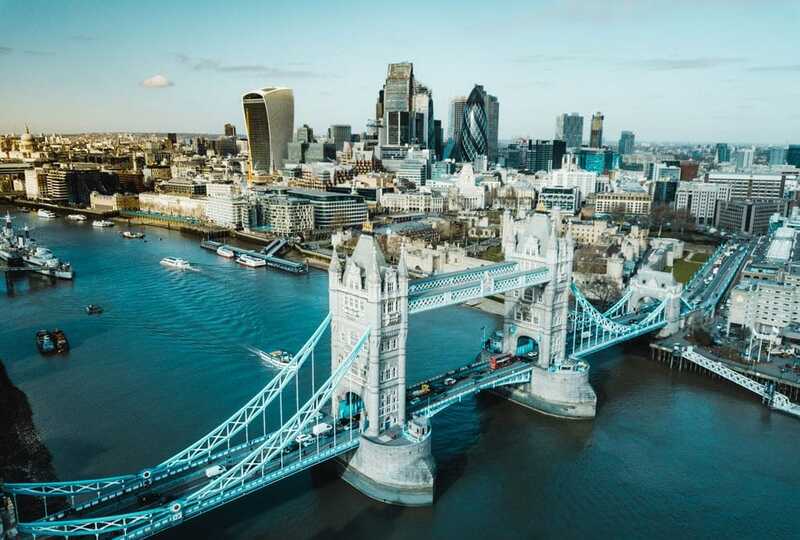 London is one of the world’s oldest cities and since its creation in Roman times, it has continuously developed and changed. Up until the 17th century, the city was contained within one square mile, but nowadays it sprawls for more than 600 square miles. Along with the growth at ground level, the city has also seen a trend for building taller and taller skyscrapers. All of these changes mean that the skyline has altered over time too, and there are many more buildings planned for the near future. The London skyline will continue to evolve. St Paul’s Cathedral has been in existence for 1400 years. It was originally built on the highest point of London. The current version of the building, by Sir Christopher Wren, was constructed between 1675 and 1710 and the dome dominated the skyline for more than 300 years. In fact, up until the 1960s, the capital was relatively low-rise. This was, in part, due to Queen Victoria’s building act banning buildings taller than 80 feet tall. In 1966, after the act was lifted, The Post Office Tower – now called BT Tower, was constructed. It was the city’s tallest structure for 10 years and its revolving restaurant on the top floor was a popular tourist attraction. Other large buildings that were constructed during this era have helped to shape the skyline, such as Battersea Power Station. It may not be a skyscraper but its famous four chimneys are an iconic landmark. In 1976 the National Theatre was built along the South Bank, a heavily criticised building it was made from harsh concrete now named Brutalist architecture. It is loathed by some and loved by others, but it is now protected with listed building status. It wasn’t until the late 20th century that London started to build skyscrapers in earnest. In the 1980s the Nat West Tower became the tallest building at 193m. It has since been renamed Tower 42 after the number of floors it contains, and it is located in the heart of the city. In 1990, One Canada Square, 237m high, became the tallest building in the capital as Canary Wharf was developed. A decade later, numbers 8 and 25 Canada Square were created to be almost as tall standing at 200m, and the area became established and sought-after with residential homes, a shopping mall and new office spaces. The Millennium saw some new and exciting structures re-shape the view of the capital. Along the Thames at Southbank, the Millennium Wheel was erected to celebrate the year 2000 and was the biggest Ferris wheel made at the time. The iconic giant wheel with egg-like pods changed the look of the city. Now called the London Eye it attracts tourists every day of the year. Further up the river, the Millennium Dome was also created in an underdeveloped peninsula near Greenwich. The huge tent-like construction is instantly recognisable and has seen the area boom after becoming an entertainment venue. In 2002, City Hall, the Mayoral offices, was constructed near Tower Bridge. The all-glass building has earned the nickname The Onion because of its similarity to a pile of onion rings. In 2003, the Gherkin, as it is affectionately known, was completed measuring 190m tall. Its address is 30 St Mary Axe, in the Financial District and the nickname comes from its long, oval shape. The distinctive criss-cross pattern that encases the whole structure makes the building stand out clearly. Currently the third tallest building of the capital, the Heron Tower was opened in 2011 at 110 Bishopsgate which is not far from The Gherkin. It stands 230m tall and is a commercial building of mainly office space. Apart from its height, it isn’t a remarkable structure so it’s not instantly recognisable. The tallest building is currently The Shard. Standing at 310m it was finished in 2013 and is located at London Bridge station. It was essentially a renovation project – formerly Southwark Towers, it was bought and extensively re-built over 12 years. The vision for The Shard was of a ‘vertical city’ filled with a diverse range of services. It has lived up to the vision and is now an ultra-modern mix of residential homes, offices, restaurants, bars, clubs a hotel and a viewing platform. The top of the building is jagged and almost looks incomplete. This is where The Shard of Glass got its name. Often lit up at night, this skyscraper has become a much-loved landmark on the capital’s skyline. Another building that stands out on the skyline is the 5th tallest construction known as the Walkie Talkie building at 20 Fenchurch Street. This odd, top-heavy construction caused havoc at first. The curved shape reflected the sun rather like a magnifying glass, and in the heat, allegedly caused plastic car-parts to melt. At the top of the 38-storey building is a sky garden and bar that is popular with visitors. Although there have been many new skyscrapers in the capital, there are many more in the planning stage. An area of the city that is being developed at speed is the East End, most notably the Shoreditch area. The East End was a poor and over-crowded area of the city, overlooked by big companies who weren’t interested in the location. In the late 1990s, it became a popular area for new technology start-ups because the rents were low and the contracts were easy to come by. By 2004, it became a new technology hot spot, and these days Shoreditch is the 3rd largest area for tech start-ups, behind the USA and China. Of course, cheap rent is now a thing of the past as Shoreditch becomes a trendy place to work and live. Google, Facebook, Intel and other technology giants all have space in this part of the city now, and the Old Street roundabout has earned the nickname ‘Silicon Roundabout’ inspired by Silicone Valley in California. As Shoreditch changes, property developments have taken place. Under construction is Principle Place, a 15-storey office building off Shoreditch High Street that is also home to restaurants, a gym, shops and a plaza. Next to it will be skyline-altering Principle Tower – at 50-storeys high it will change the way the East End looks. Also on its way is The Stage, a development with a theme inspired by Shakespeare’s Curtain Theatre – the remains of which were uncovered at the new building’s site. When complete, there will be 37 floors of high-quality apartments along with offices, shops and a sky bar. With its popularity growing fast, Shoreditch will continue to change with the times and the skyline of the city will evolve some more. Sign me up for site updates. How did Google win the battle of the search engines? Copyright © 2010 - 2019 Dalaric Ltd. All Rights Reserved.